Over-fishing threatens coastal cetacean populations around the world. In Vietnam, there is no conservation status assessment for any cetacean species. 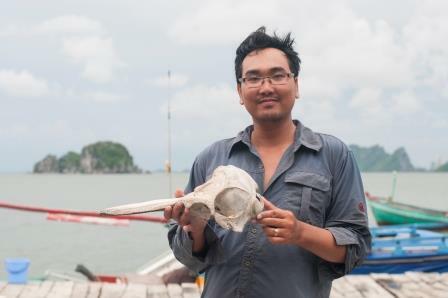 In Kien Giang Biosphere Reserve (KGBR) unsustainable fishing persists, along with a lack of knowledge on cetaceans, prevents conservation actions and management policies from being implemented. Our project is the first on cetacean conservation in KGBR and Vietnam.We aim to ascertain the conservation status of cetacean in KGBR and improve local stakeholder awareness of this species. To do this we will conduct boat-based surveys in KGBR to map species distribution and estimate abundance. We will also interview local communities to collect additional data and use communication tools to raise awareness on cetacean conservation among local stakeholders. In addition, we will also contribute data on the conservation status of cetacean and provide recommendations for conservation and management of the species. Our results will give local authorities, government agencies and NGOs critical information to develop cetacean conservation programmes and leave a legacy for future cetacean conservation initiatives in this area.